We decided early on that maps would serve as the key organizing principle for the blog’s visual and information design. The narrative is entirely linear: Matt is walking from the east coast to the west coast one day at a time, and that geospatial and temporal linearity is a compelling framework through which to present his experiences. We settled on a work flow that sees Matt upload at least one photograph every day from his mobile phone, usually with a sentence or two describing a moment or story. These photographs, automatically geotagged by the phone’s built-in GPS, are plotted onto a large map at the top of the home page which provides an immediate, specific point of entry into the story while giving a feel for the trip’s recent progress. Each post is marked with “Day x” to indicate the number of days Matt has been on his journey. A smaller map takes daily coordinates from a GPS beacon carried by Matt and plots his course with a red line to give an overview of his progress. 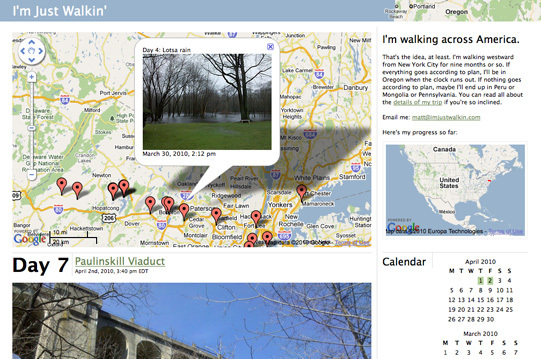 I’m Just Walkin’ runs on WordPress with a custom theme, using the Google Maps API, the Flickr API, and custom scripts for extracting and plotting coordinates from the SPOT Satellite Messenger. Matt carries a Motorola DROID running PixelPipe and WordPress for Android.